Although PROFIBUS and PROFINET are well-established and easy to use technologies, training is essential for those making use of this advanced automation technology. It gives you the necessary skills and confidence to implement and make use of the most widely used automation technologies. 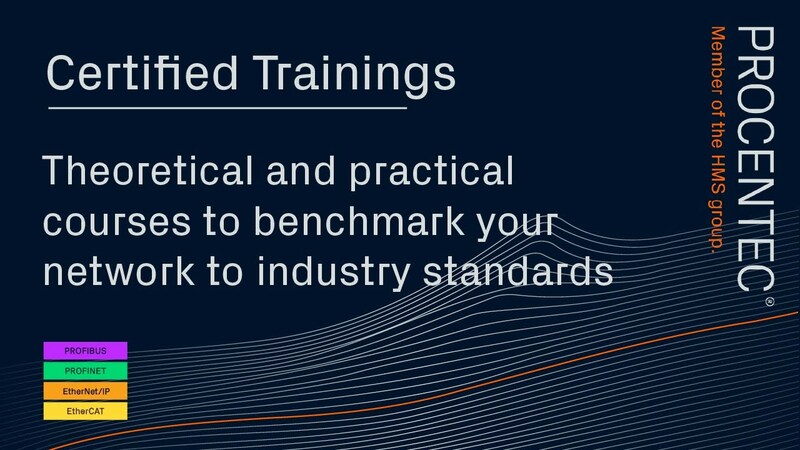 Ultimately, the right training is both a short- and long-term investment to ensure that operations run well without unexpected downtime. Why choose for training by PROCENTEC? These training courses are useful for personnel who work daily with PROFIBUS and PROFINET, as well as for staff who hold a supervisory role. The trainings are focused on electro-technicians who are preoccupied with installation and maintenance, in addition to product vendors and engineering companies that want to develop their own PROFIBUS product. With the knowledge acquired at our courses, projects can better be carried out and managed and contractors gain the insights to understand what is happening in all aspects of the installation. During the training courses, you become acquainted with PROFIBUS, PROFINET and the AS-interface. We study the properties of cabling, explore the best ways to set up an installation and we address the most frequently made mistakes that occur as a result of lack of expertise. We also offer you the opportunity to discuss your personal situation for advice on the best way to proceed. Do you want to expand your knowledge of PROFIBUS and/or PROFINET? At PROCENTEC, we have true professionals in this field. All the necessary expertise is available and we are happy to offer our support. We are a certified PROFIBUS and PROFINET Competence Center and Training Center. See below for a full overview of the PROFIBUS and PROFINET training courses that we have to offer. If you choose for a certified training and you pass the course, then your name is placed on an official list of certified PROFIBUS/PROFINET (installation) engineers. Have a look at the present overview of certified colleagues. Maybe one day you will find your own name on the list. The Certified PROFIBUS Engineer (CPE) training course is an internationally recognized training program. It has been established with the goal of creating a quality platform for PROFIBUS qualified engineers who are acknowledged with an officially accredited diploma. After graduation you can be proud to be an exclusive member of the PROFIBUS specialist platform. The PROFIBUS Troubleshooting and Maintenance training course is fully concentrated on those who install and maintain PROFIBUS installations. A complete knowledge package is provided to you that can be put into practice immediately. This free training is concentrated on the number 1 troubleshooting tool for PROFIBUS networks. You will learn how to use the powerful features to identify errors, speed up maintenance, accelerate commissioning and optimize network performance. The Certified PROFIBUS Installer course is essential for electrical engineers and technicians requiring the necessary installation and testing skills for their PROFIBUS DP/PA projects. These technicians are often the final link in a project and are essential both during commissioning and throughout the life cycle of the installation. The 'Certified PROFIBUS Engineer' course is a world wide recognized training program. It has been founded to create a quality platform for PROFIBUS qualified engineers who are acknowledged by an official exam. This free training is focused on the number 1 permanent monitoring tool for PROFIBUS and PROFINET networks. You will learn how to use the powerful features to identify errors, speed up maintenance, accelerate commissioning and optimize network performance. The 'Certified PROFINET Engineer' course is a world wide recognized training program. It's standardized by PROFIBUS International to create a quality platform for PROFINET qualified persons who are acknowledged by an official exam. The Certified PROFINET Installer training course is essential for electrical and commissioning engineers or technicians who require the globally recognized PI International installation and testing standards for their PROFINET projects. These technicians are often the final link in a project and are essential during commissioning and the entire life cycle of an installation. The Certified PROFINET Installer training course will increase technicians’ understanding of PROFINET best practices, decrease common installation errors and lay the foundations for becoming a PROFINET Certified Engineer or T&M expert. The Industrial Ethernet Introduction course is essential for anyone starting to work with standard or Industrial Ethernet, as Ethernet installations are not simply connecting Ethernet cables. Terminology and best practices are important to know when working with Ethernet installations. This training course provides the required basics for technicians to properly install, maintain or troubleshoot an Ethernet installation. The Industrial Ethernet Introduction Course will provide a basic understanding of the differences between Ethernet based bus systems and the pros and cons between protocols and technologies. This free online Atlas training is focused on the most powerful troubleshooting tool for Industrial Ethernet networks. You will learn how to use its impressive features to identify errors, speed up maintenance, accelerate commissioning and optimize network performance to prevent downtime in your network.